The girl in the yellow dress speaks. Autumn lets itself go and comes again. we are fashioned into dreams. and the wind, will leave you, confused. but take heed. And know that, you are coming. only frailty’s search for a spring that lasts. its fragrance carries me over a silence that was never my own. The hereafter bears a portrait of me. 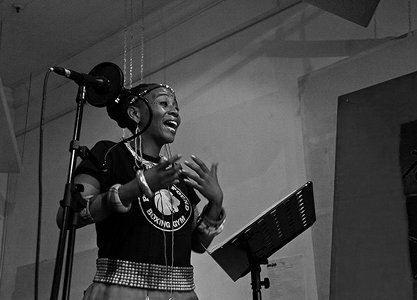 Mbali Vilakazi is a child of the city by the sea, who came into being under the watchful eye of a silent mountain. She is born on the 9th day of the 9th sign. The Archer. She is Nona’s daughter, Mzamo’s sister and Avumiles aunt. A woman who holds the gaze and the spectator in her own life. Tracing her beginnings as a patient journey into herself, she holds the dream of a youth that rises to assume both its relevance and place. Touched by the wisdom in children, she remembers that it is always the little things. Soul Activist, Poet, Flower. She is a Fairy. And the Queen in exile. With pen as sceptre and her throne a cloud. On a mission to answer the call. She hears voices, sees in the dark and when she gows up, she wants to be Sade.